A Great card game and a Great strategy board game. The first player to correctly guess the identity of the face down, center cards WINS. Play time about 45 minutes. 3--one deck of small playing cards. 4--six tokens, different colors, to represent players. 5--two numbered, six sided dice. 6--one stylized token, to sit on top of the face down cards. spade, 1 diamond and 1 club. [ SGNA square ] WINS the game. 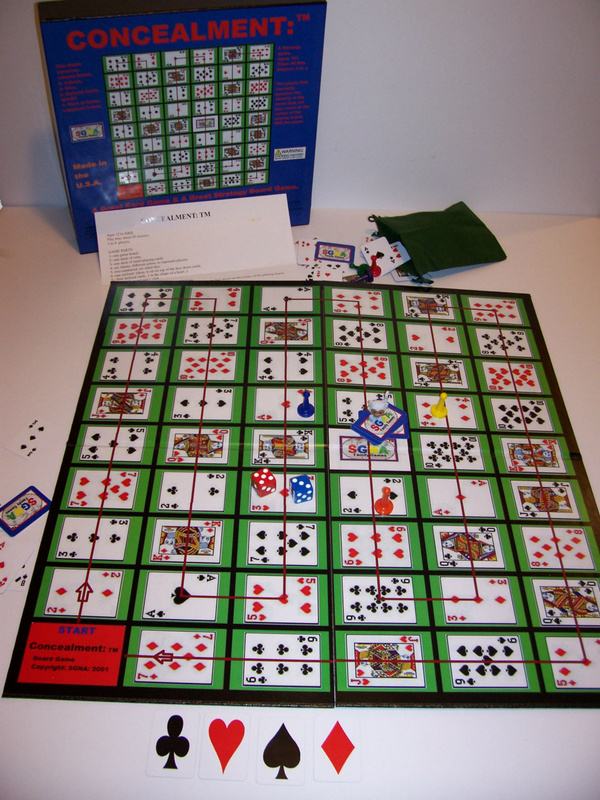 When there are 3 players, each player is dealt 15 cards and 7 cards are placed face down on the space provided on the playing board. 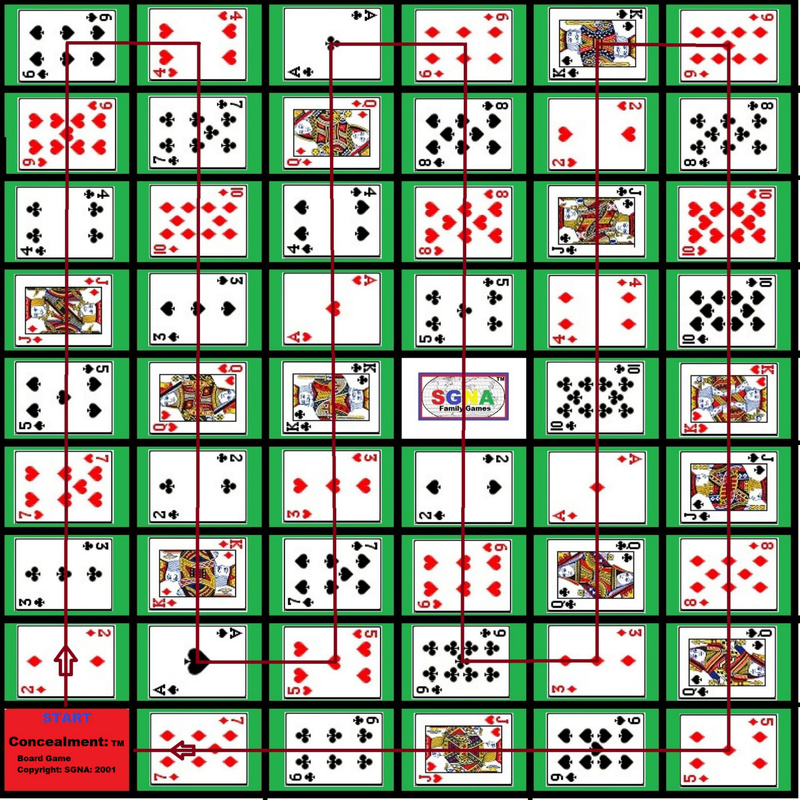 When there are 4 players, each player is dealt 11 cards and 8 cards are placed face down on the rectangle provided on the playing board. The players do not know the identity of the cards that are placed face down. The stylized token is placed on top of the face down cards on the game board. Each player looks at his cards and the first player roles the 2 dice and moves his token the proper number of spaces. If for example: The first player lands on the seven of hearts then the player that is holding the seven of hearts card has to place this card on the seven of hearts space on the game board, face up. If none of the players is holding the seven of hearts card, then this card must be one of the cards that is face side down on the playing board. It is then the next players turn. The next player roles the dice and moves his token the proper number of spaces. If for example: The player lands on the four of clubs space and it is covered by the four of clubs card and if one of the other players is the owner of that suite of cards [Clubs]. Then this player can pick any card at random from the, [Clubs owner] players hand and looks at it and then give it back to the [Clubs Owner] player. If no player owns the clubs suit then nothing happens and play continues to the next player. The other players are not allowed to look at this card. It is within the rules that if one of the players gets to look at one of the other players cards, that he can discretely or secretly write the name of the card down on a scrap piece of paper, so that he can keep a record of the cards that he has seen. It is then the next players turn. Game play continues and the rules are repeated. if he is holding any cards in his hand, they are to be placed face up on the table, so that the other players can see them. Game play then continues to the next player. If all the players except one put themselves out of the game by guessing wrong, then the remaining player WINS the game. If a player lands on the start square then he is given another turn. A player can not land on the space that has the cards face down on it, the player goes to the next square. If 5 people decide to play, each is dealt 9 cards and 7 cards are placed face down. If there is 6 players, each is dealt 8 cards and 4 cards are placed face down at the center. Players 5 and 6 will have to pick a card suit and label it on a piece of paper. All other rules apply.